Another epistemological position, connectivism, has emerged in recent years that is particularly relevant to a digital society. Connectivism is still being refined and developed, and it is currently highly controversial, with many critics. In connectivism it is the collective connections between all the ‘nodes’ in a network that result in new forms of knowledge. According to Siemens (2004), knowledge is created beyond the level of individual human participants, and is constantly shifting and changing. Knowledge in networks is not controlled or created by any formal organization, although organizations can and should ‘plug in’ to this world of constant information flow, and draw meaning from it. Knowledge in connectivism is a chaotic, shifting phenomenon as nodes come and go and as information flows across networks that themselves are inter-connected with myriad other networks. The significance of connectivism is that its proponents argue that the Internet changes the essential nature of knowledge. ‘The pipe is more important than the content within the pipe,’ to quote Siemens again. 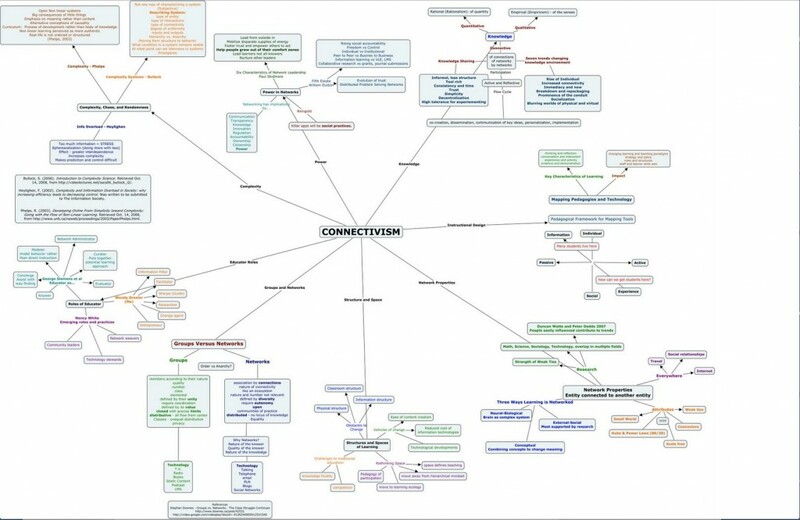 Figure 2.6.1: A map of connectivism Image: © pkab.wordpress.com. Click and drag for a larger image. (b) seeks to describe the practices that lead to such networks, both in the individual and in society – which I have characterized as modelling and demonstration (on the part of a teacher) – and practice and reflection (on the part of a learner). Siemens, Downes and Cormier constructed the first massive open online course (MOOC), Connectivism and Connective Knowledge 2011, partly to explain and partly to model a connectivist approach to learning. Connectivists such as Siemens and Downes tend to be somewhat vague about the role of teachers or instructors, as the focus of connectivism is more on individual participants, networks and the flow of information and the new forms of knowledge that result. The main purpose of a teacher appears to be to provide the initial learning environment and context that brings learners together, and to help learners construct their own personal learning environments that enable them to connect to ‘successful’ networks, with the assumption that learning will automatically occur as a result, through exposure to the flow of information and the individual’s autonomous reflection on its meaning. There is no need for formal institutions to support this kind of learning, especially since such learning often depends heavily on social media readily available to all participants. There are numerous criticisms of the connectivist approach to teaching and learning (see Chapter 6, Section 4). Some of these criticisms may be overcome as practice improves, as new tools for assessment, and for organizing co-operative and collaborative work with massive numbers, are developed, and as more experience is gained. More importantly, connectivism is really the first theoretical attempt to radically re-examine the implications for learning of the Internet and the explosion of new communications technologies. 1. What areas of knowledge do you think would be best ‘taught’ or learned through a connectivist approach? 2. What areas of knowledge do you think would NOT be appropriately taught through a connectivist approach? You might like to come back to your answer after you have read Chapter 6 on MOOCs. Siemens, G. (2004) ‘Connectivism: a theory for the digital age’ eLearningSpace, December 12. 2.6 Connectivism by Anthony William (Tony) Bates is licensed under a Creative Commons Attribution-NonCommercial 4.0 International License, except where otherwise noted.